Lo and behold, the MSP University book giveaway just started, and now there’s even MORE MSPU goodness to be had! In addition to the previously mentioned three copies of The Guide to a Successful Managed Services Practice, written by the incomparable Erick Simpson, I’m also giving away two copies of Erick’s The Best I.T. 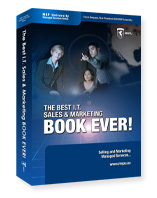 Sales & Marketing Book Ever! (MSRP $149.95) to a pair of lucky winners! Same terms apply. Complete the super-short survey on managed services, and get one entry for ALL the giveaways for the month of August. Winners of the MSPU books will be drawn randomly from all survey entries completed as of 11:59p Central time, Sunday August 16.